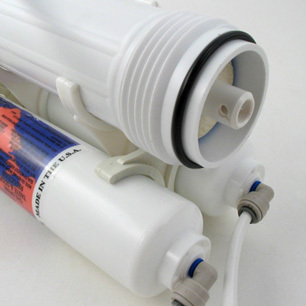 The reverse osmosis membrane for your unit is packed in a special bag to assure long shelf life. It should be installed shortly before you plan to install and start up the unit. Remove the tube that enters the cap end of the membrane housing by pressing in on the collet of the fitting and pulling out the tube (Fig. 1). 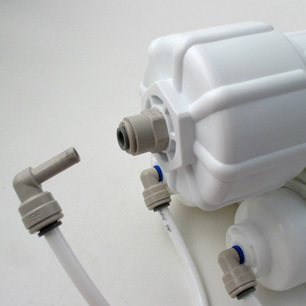 Then remove the membrane housing cap. It screws off counterclockwise. 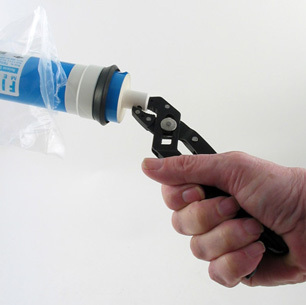 Holding the membrane with pliers, put it under a water tap. This isn't to rinse the membrane but to wet the o-rings and the rear skirt for lubrication so it will slide easily into the housing. 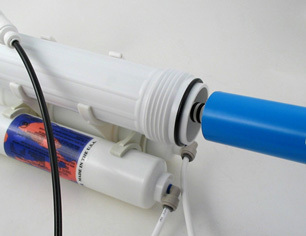 Replace the cap and the tube and you're ready to go.